and brown queer bodies at large and the real individuals that become contemporary martyrs for justice in the face of adversity. More speci cally the pieces look at the queer people of Jamaica and the Gully Queens in the nation’s capital, Kingston. The Gully Queens are a group of homeless LGBTQ youths who live in a storm drain (or ‘gully’) in the country’s capital. They are leading the ght against the Caribbean nation’s institutionalized homophobia/ transphobia through visibility, community and an outspoken attitude towards their position in society. Much like the houses and “families” that formed in New York City in the mid-to-late 1980s – captured in the iconic documentary “Paris is Burning” – these Gully Queens have formed a sense of community and activism through visibility that has taken Jamaica and international society by storm. The Gully Queens and their growing community is brought to light in this body of work using historical classic art as a framework. 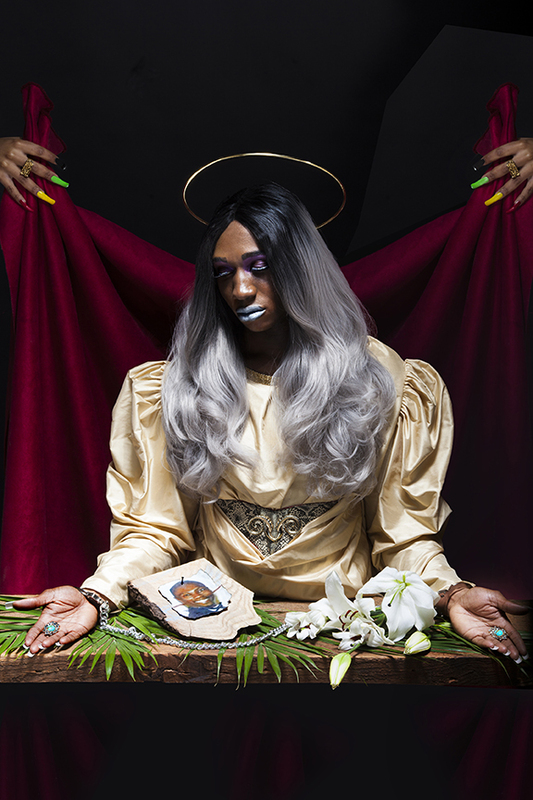 With the blend of Jamaica’s predominate Protestantism society, history of homophobia/ transphobia and dancehall culture, the images reappropriate history to highlight these real, contemporary, and heroic gures.